An 8-year-old boy presented to the emergency department with right upper-quadrant abdominal pain and a laceration after falling onto the handlebars of his bicycle. 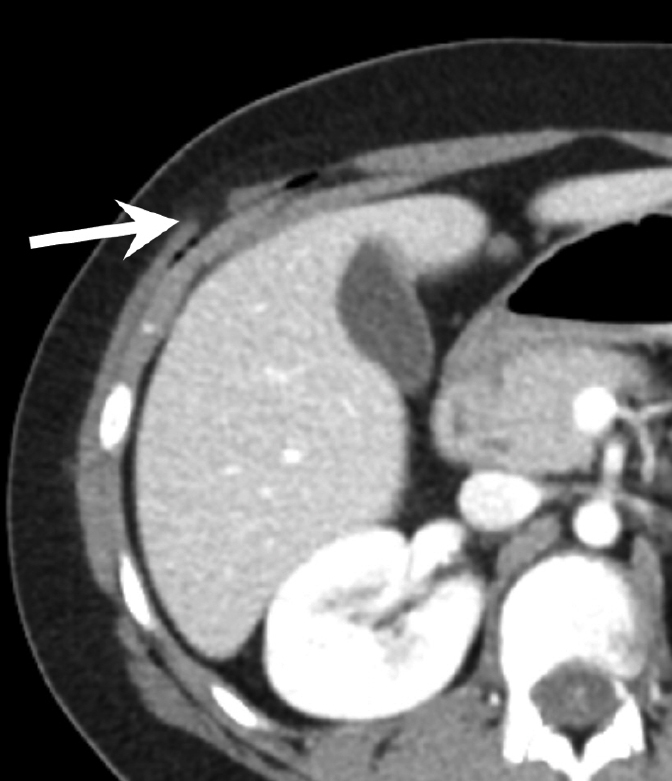 A contrast-enhanced CT scan of the abdomen and pelvis demonstrated a right abdominal-wall defect with air tracking from the skin surface into the subcutaneous fat deep to the level of the rectus musculature. There was disruption of the semilunaris fascia and right internal and external oblique muscles with omental fat herniating between the inferior margins of the liver through the abdominal wall defect (Figures 1A-C). Surgery was consulted for possible repair of the traumatic hernia. Traumatic abdominal wall hernias are uncommon. They were first described by Selby in 1906.1 Later, Dimyan et al described the relationship between abdominal hernias and handlebar injuries.2 By 1994, fewer than 100 abdominal hernias related to handlebar injuries had been described.3 Handlebar hernias occur secondarily to the sudden force of the handlebar impacting a focal area of abdomen. This causes disruption of the underlying abdominal muscle and fascia without necessarily disrupting of the overlying skin. 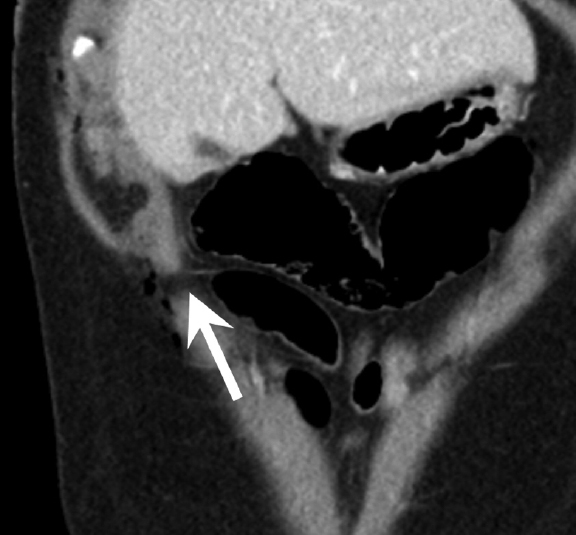 Handlebar hernias are much more common in males due to their propensity for pursuing high-risk activities. The mean age of occurrence is 9.5 years.4 Patients with handlebar injuries typically present with pain, bruising and soft-tissue swelling at the site of injury. While traumatic abdominal wall hernias can be diagnosed clinically, typically the diagnosis is made via CT. CT helps the surgeon by showing the defect, identifying the contents of the hernia, and showing associated injuries. While there have been reports of ultrasound being used to diagnose traumatic abdominal wall hernias, it is considered a secondary modality due to its high user dependence and lack of sensitivity for detecting the associated injuries. Patients with a handlebar hernia are treated with surgery. Most reports recommend urgent repair of the defect in order to prevent incarceration and to identify and potentially treat associated internal injuries. Although traumatic abdominal hernias are uncommon, they should be suspected in the correct clinical context. 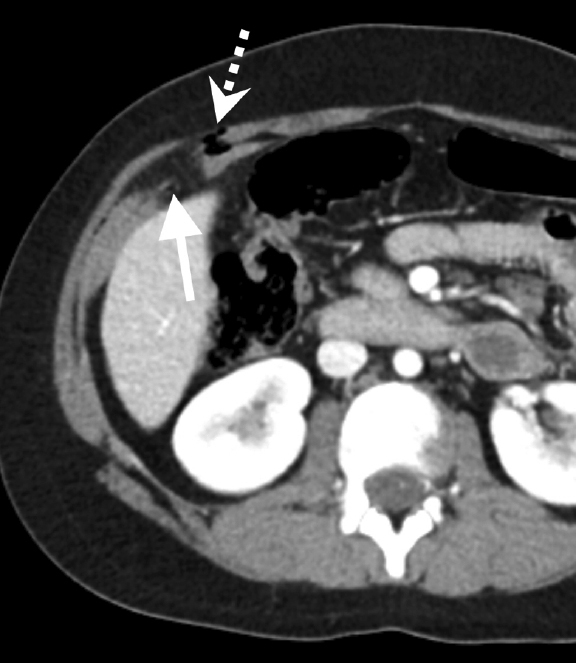 Contrast-enhanced CT remains the modality of choice to diagnose traumatic abdominal hernias due to its ability to identify the hernia defect and associated injuries. Selby CD. Direct abdominal hernia of traumatic origin. JAMA. 1906;47:1485–1486. Dimyan W, Robb J, MacKay C. Handlebar hernia. J Trauma.1980;20(9):812-813. Damschen DD, Landercasper J, Cobill TH, Stolee RT. Acute traumatic abdominal hernia: Case reports. J Trauma. 1994; 36:273–276. Yan J, Wood J, Bevan C, et al. Traumatic abdominal wall hernia—a case report and literature review. J Pediatr Surg. 2011; 46(8):1642-1645. Rathore A, Aimpson BJ, Diefenbach KA. Traumatic abdominal hernia: an emerging trend in handlebar injuries. J Pediatr Surg. 2012; 47(7):1410-3. Traumatic abdominal wall hernia. Appl Radiol. Prepared by Dr. Ahmed and Dr. Alexander Towbin while at Children’s Hospital Medical Center, Cincinnati, OH; and Dr. Richard Towbin while practicing in the Department of Radiology, Phoenix Children’s Hospital, Phoenix, AZ.